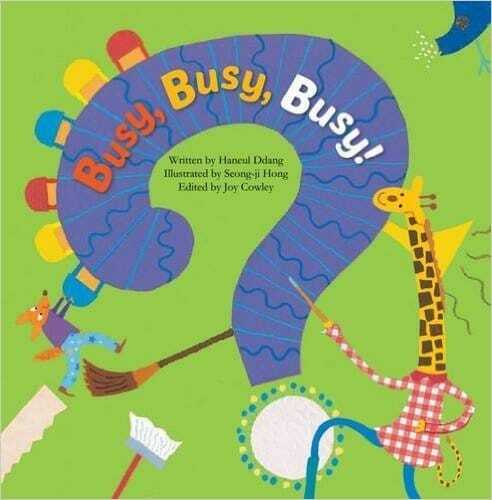 Haneul Ddang’s ‘Busy, Busy, Busy!’ is part of the world’s largest mathematical story picture book series, called TanTan Math Story (70+ titles). The English translation of this original South Korean version was done in 2015. The story is about different animal families are seen busy making repeated patterns of objects, colours and sounds. For example, a chain of different flowers being carefully made, a series of little balls of different colours being hung on the end of some lace, different kinds of lines being drawn on walls, chairs of different colours being arranged around a table, and sounds of different musical instruments being made. The purpose of this hive of activity is not revealed until the end of the story. The story is useful in showing very young children that patterns are not only about what they can see, but patterns also include what they cannot see like sounds too. Like most titles in this series, the book comes with a few mathematical word problems relating to the story to be solved at the end of the story. All in all, ‘Busy, Busy, Busy!’ is a useful story to introduce the concept of patterns to children aged 5+ years old.